What one needs for a perfect photo shoot? Maybe hiding those horrible pimples and spots, smoothing the wrinkles, outlining eyes, defining the eyelashes and whitening teeth would be enough. As there’s an app for everything and anyone in today’s world, the amazing Visage Lab will make you ready for a perfect shot automatically! Being a portable beauty laboratory for facial photos, the app removes pimples and wrinkles, outlines the eyes and whitens the teeth in seconds, with all operations made inevitably! 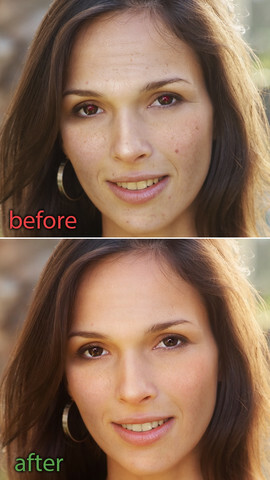 In difference with numerous photo-editing apps available in the App Store, the Visage Lab offers a full-package approach to image enhancement, as well as giving the portrait a natural look with the makeup made to it.. On top of the face retouching, Visage Lab includes over 40 classy effects to add more style and character to the photos. Here’s how Visage Lab works – once you select a portrait photo from your iPhone/iPad or make a shot with your camera, the app will do the rest! After applying eye and skin makeup, removing wrinkles and oily glare, whitening the teeth, removing red-eyes (if necessary) and performing smart color correction, you’re able to compare the before and after photos to evaluate the changes. Scrupulous users are able to modify the settings and exclude the options they think are unnecessary. Finally the images can be shared with the world via Facebook, Twitter, Instagram, Pinterest and e-mail! • In case there are several faces in a photo, all of them get enhanced! The app supports English, French, Italian, Russian and Spanish languages and is designed for both iPhone and iPad. Visage Lab is available on iTunes in two versions: Free and PRO HD! But before you rush to the App Store to make yourself beautiful with the app, hold on a moment – we have three promo codes to give away for the paid version of the Visage Lab! Just contact us with a Visage Lab in a subject line to get one!